Lately, I’ve been advocating putting in more effort to the small things you do outside the gym, rather than place all energy into your workout of the day. I will push you to stretch, cool down, do mobility work, and take rest days as much as I’ll get in your face at one of my classes. Why? Because these things help you move better—that’s a fact backed by science. There was a time when all I wanted was to go ham in a workout. To me, there was no better than feeling than laying on the ground afterward knowing I gave it my all. But the older I get (I’m going to be 30 in six months!) the more I play the long game. I have zero desire to get injured. I have zero need to not be able to stand after a workout. I want to move, live life, and feel good for as long as I’m on this Earth, and that means I HAVE to take care of the little things. —Which is why I’m pushing each of you to take care of the little things, too. And today I want to talk to you about a basic necessity to an active lifestyle that none of us do enough: stretching. Stretching keeps your muscles flexible, strong, and healthy; all while maintaining a range of motion within your joints. If you don’t stretch, move dynamically, or do mobility work, you are only setting yourself up for failure (i.e. injury). Throughout the workday: If you sit at a desk all day, find 5-10 minutes to stretch throughout your working hours (more on this below). Like I said, I really, REALLY don’t want to say this, but it’s a question I felt I should address (for more on this, read my post on Why You Need The Warm-Up). For your hips, try: hip circles. Hip circles: Stand tall and draw your knee up towards your chest. Take the your knee out to the side and then behind you. Finally, tap the ground with your foot and create that same circle with an internal rotation. Draw your knee out to the side and then in front of you. Perform five reps going both directions on both legs. To work your shoulders, do: shoulder rolls and shrugs forward and back. Draw your shoulder up towards your ears and then forward in front of you. Perform the same movement in reverse letting your shoulders go down your back. To stretch your wrists, get into: palm flip in tabletop (Get on all fours. Turn your hands so your fingers point toward your knees. You should feel a stretch in your forearms and wrists) and wrist circles : clasp your hands together with your fingers locked. Make a figure 8 motion with your hands going one way and then the other. Do this 10 times per direction. To loosen your knees, try: Lateral lunge and deep sumo squats. 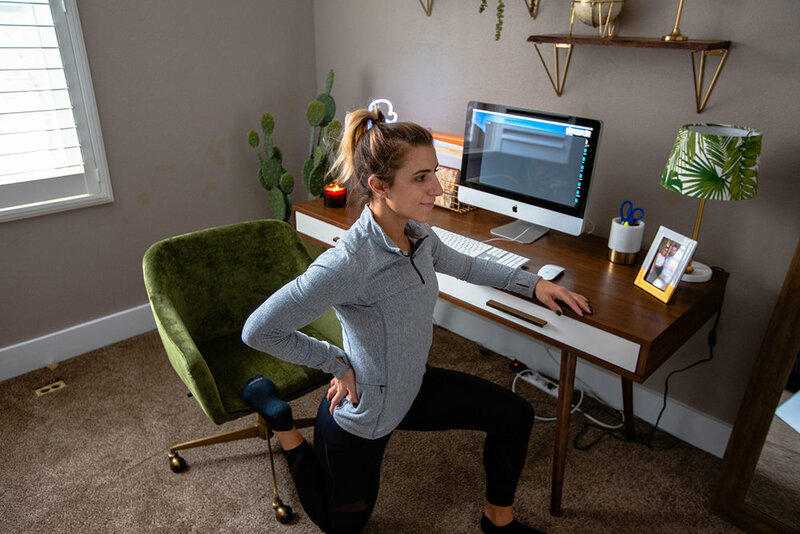 Lateral lunge: Step your foot out to the side with both toes pointing forward, sit deep into the foot that you just stepped out and then stand tall. Sumo: with your toes pointing out and heels in, sit as low as you can in a squat with your heels staying on the ground. For your ankles, do: ankle rolls and heel walks. Ankle rolls: Sit down with your legs long in front of you. Roll your foot one direction, then the other, creating big circles with your toes. Heel walks: Stand tall and take your toes off the ground. Walk the length of a yoga mat on just your heels, leaving a soft bend in your knees cerating dorsiflexion. I know, I know—after the workout, the last thing you want to do is cool down. But it’s important! As long as you stay vertical, you can get by with as little as five minutes (I’d prefer if you did ten) of stretching. Do static holds, stretching your legs, arms, and back. You could even grab a foam roller or tennis ball, working out your muscles. Typing at a desk all day is not natural for your body. Your hips get tight from sitting in a chair. Your shoulders round forward as you reach for your keyboard. Stretching can help loosen this up (and break up that break fog as well!). If you’ve been putting off stretching your entire life (hey, I did it for twenty-two-ish years) this might be a little new to you. Whenever I try something that’s pretty unfamiliar, I want to someone to just TELL me what to do. In the TL Method, I tell you exactly how to warm-up, cool down, stretch, and do mobility work. Give it a shot and let me know what you think. Have you been able to fit in stretches between work and workouts? Or do you ignore it altogether? Let us know in the comments!